Every so often, when we have a destination we think might appeal, we ask La Fugue - a Parisian agency specializing in musical travel- to put together a tour for our supporters, patrons, and board members. 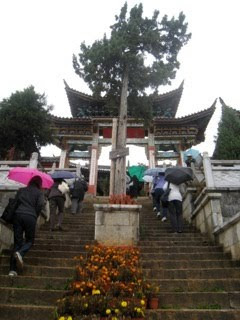 The last trip was to China for our debut tour in May. 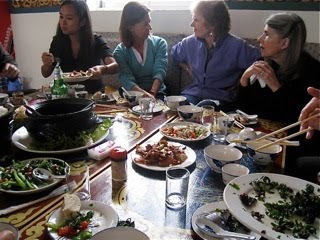 This year two of our Board members ( Kathy Henschel, soon to be Chair of our Board, and Ann Goodbody - a board member from New York, one of their friends, and a group of French customers of La Fugue joined us in Shanghai - where we had two nice dinners together. They came to our exchange at the Conservatory of Music, and then cheered us on through the unique experience of the San Francisco Gala on Saturday night ( see below.) 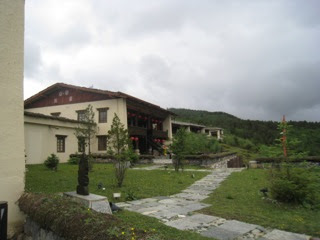 We then went on to Shenzen, and they went on to Shangri -La to stay here in the Banyan Tree Resort, at 11,000 feet. 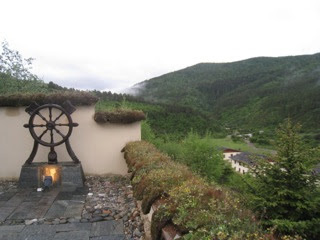 The unusual weather this year - it doesn't usually rain up there- made for a trip which had to adapt to the conditions, but which ended with a spectacular dinner last night. The itinerary had had to be changed today because the incessant rains had caused the Tiger Gorge to be closed. 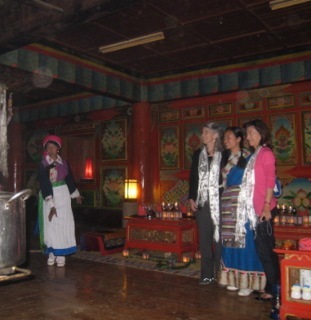 The patrons went instead to visit a Tibetan family and see a little of how they live, and to a famous temple in Shangri-La. The altitude makes a set of steps like this a challenge. 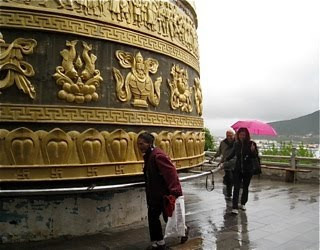 Ann took a turn helping to turn the gigantic temple prayer wheel. 3 turns (and it's heavy) will bring you good luck. Ann, Kathy and Fa at lunch after the Temple visit at a restaurant in the town of Shangri-La. 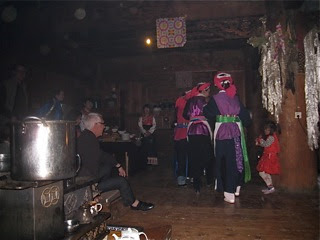 The vegetable dishes were delicious as was yak meat with mint! La Fugue specializes in surprises. 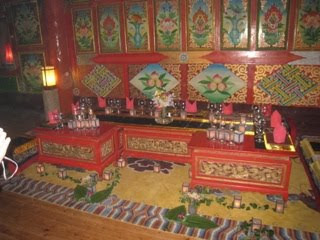 For the patron group's last evening, dinner was served in a private Tibetan house - this was the dinner table. Fruit juice and real French Champagne ( brought from Paris by La Fugue's Olivier Luciani - there were French people involved so he had to) preceded the meal, as everyone sat around the fire, then 8 or so courses were served including, again, yak, which is very good. The yak's belonging to this family live - as yaks do in this part of the world- right below, but they had apparently gone out during dinner. 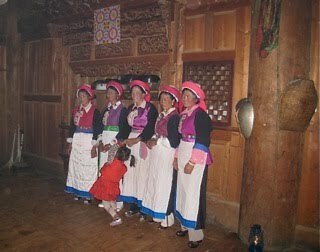 A group of 5 young women (joined by one of their children) danced a dance of welcome. The surprise ending of this magical candlelit evening in which the patrons were enveloped in the extraordinary hospitality of the occupants of the house was Chanticleer singing "Summertime." 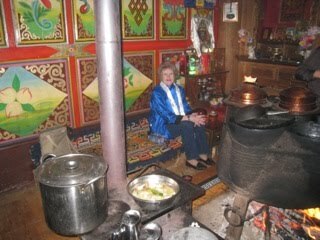 Way up in Shangri-La in a Tibetan house, Ann Goodbody's I-Pod was rigged up to the speaker on which the dance music has been played to enable this experience of two worlds. Ann Goodbody and Florence Liddell are warmly welcomed. Kathy Henschel enjoys the fire. It was a little cool in Shangri-La.